The Arab-Israeli conflict (Arabic: الصراع العربي الإسرائيلي, Hebrew: הסכסוך הישראלי ערבי) spans nearly a century of political tensions and open hostilities. It involves the establishment of the modern State of Israel as a Jewish nation state, as well as the relationship between the Arab nations and the state of Israel. Three major armed confrontations, several smaller scale conflicts, acts of terror followed by reprisals, illegal occupation of territory, all feature in the conflict. So too do several peace initiatives and a number of treaties normalizing relations between Israel and two of her neighbors. Through the United Nations the international community has been involved in the conflict throughout its existence, since Resolution 181 was the legal basis for Israel's declaration of statehood on May 14, 1948. Since the disputed area is considered to be a Holy Land by Jews, Christians and Muslims, the conflict has attracted a great deal of interest. The geo-political location of the conflict, too, adjoining the zone where the world's largest petroleum exporting countries are located, has added urgency to its resolution. Much effort has been invested in the peace process, yet comparatively little has been achieved. Thousands of Palestinians are still refugees. Upwards of three million people living on the West Bank and Gaza do not possess citizenship of a sovereign state, and remain impoverished. Failure to resolve the conflict has also resulted in a strained relationship between the Muslim world, which supports justice for the Palestinians, and the West especially the United States, which is perceived to be pro-Israeli, fueling talk of a "class of civilizations." Achieving a durable, just peace remains one of the most imprtant goals of international diplomacy. The conflict is sometimes referred to as the "Middle East conflict." However, the Middle East region has been host to other conflicts not involving Israel, such as the Iran-Iraq War so the term can be misleading. Since 1979, the conflict involves the Islamic Republic of Iran (a non-Arab state, not highlighted on the map) as well. Despite involving a relatively small land area and number of casualties, the conflict has been the focus of worldwide media and diplomatic attention for decades. Many countries, individuals and non-governmental organizations elsewhere in the world are involved in or concerned with this conflict for cultural and religious reasons, such as ties with Islam, Arab culture, Christianity, Judaism, Jewish culture or for ideological, human rights, or strategic reasons. Because Israel is a democracy with a free press, the media has access to the conflict which also increases media coverage. While some consider the Arab-Israeli conflict a part of (or a precursor to) a wider clash of civilizations between the Western World and the Arab or Muslim world, others oppose this view and claim that the religion dimension is a new matter in this conflict. Animosity emanating from this conflict has caused numerous attacks on supporters (or perceived supporters) of one side by supporters of the other side in many countries around the world. 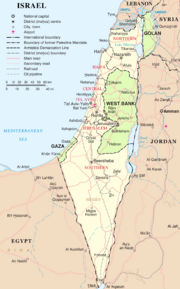 In addition to inter-state wars between Israel and her Arab neighbors, terrorist acts against Israel by Palestinian refugees and Israeli retaliations, civil uprisings against Israeli occupation following the 1967 war, numerous peace initiatives also feature in the story of this major conflict. War, in the technical sense of inter-state armed conflict between Israel and her Arab neighbors began in November 1948 and ceased with a series of armistices in 1949. The origins of the conflict can be traced back to as early as 1882. Some, who attribute the origins of the conflict to ancient animosity between Jews and Muslims, trace the origin back much further. However, from 1882, Jews began to settle in the Palestine area in increased number (some had settled over a century earlier) of what was then the Ottoman Empire's province of Greater Syria, fleeing persecution in Europe. Most of these Jews were secular. Many were socialist but they saw themselves as pioneering a Jewish colony, or even a Jewish state, in their ancient homeland. These Jews bought land from Arabs, who were often absentee landlords. Most of the land they acquired was swamp or desert, and it was with skill and ingenuity and financial help from wealthy European Jews that these settles transformed the land into profitable farms. Although migration was legal at this time, there was "strong Arab antagonism to such settlement". Britain was a strong supporter of Jewish settlement even at this time. In 1917, Britain's Balfour Declaration gave official support to the creation of a Jewish homeland in Palestine. Since 1897, the World Zionist Organization had advocated that only in a Jewish state would Jews be truly free from persecution, and although initially Palestine had not been identified as the location for this state, by 1917 it was the only location under consideration. Even before the end of World War I, Britain had already laid claim to administering the Palestine area when her representatives and France's met to carve up the Ottoman Empire among the expected victors; (Libya went to Italy). The Paris Peace Conference, 1919 ratified the distribution of territory under League of Nations mandates. The Arab delegation at the Peace Conference objected but it also ratified the intention of creating a Jewish state in Palestine, while not compromising the rights of other communities living there, that is, the Arabs. Immediately, Arabs - Christian as well as Muslim - began to object. Conferences were held. Delegations were sent to London. Anti-Jewish riots broke out, which could be said to represent the start of the actual conflict. Rioting during 1920 saw over 200 casualties. In 1922, the British Mandate of Palestine was created against strong Arab objection. Most Arabs immediately adopted a non-co-operation policy with the British. Subsequently, the Legislative Council that was supposed to be established was never created. During 1929 and 1936, anti-Jewish again riots took place. In 1936, the Arabs demanded an end to Jewish migration, which was subsequently severely restricted. Unsure how to prosecute their Mandate, the British set up the Peele Commission to advise them, which recommended that the territory should be divided into two separate states. During World War II, the Mufti of Jerusalem, whom the British had recognized as the leader of the Palestinian Muslims since 1922, despite his part in the 1920 riots, supported Adolf Hitler, convinced that a German victory would lead to the resolution of the Jewish question. Meanwhile, Jewish resistance to British rule had seen terrorist attacks agauinst them by several groups impatient with the delay in implementing the Mandate. By the end of World War II, with thousands of Jewish refugees stranded in Europe and thousands trying to run against the British blockade (restriction of Jewish immigration were still in place), Britain decided that the mandate was unworkable and declared her intention to withdraw completely on May 15th, 1948. Britain handed responsibility over to the newly formed United Nations. The UN also established a commission to advise them, which, following the Peel Commission, recommended what has become known as the "two-state solution," with a third entity, Jerusalem, under direct UN control. This recommendation became the substance of UN Resolution 181, passed November 29, 1947 against the objection of every Muslim state. 10 states abstained, including Britain 33 voted in favor, including the United States. The partition plan awarded 55 percent of the land to the Jews, who formed a 60 percent majority in the allotted area. However, no official international initiative was started to oversee the process. Given the opposition of the Arab states to Partition, they did not set any plans in motion to create or to help to create an Arab-majority state. Rioting between November and May saw at least 750 fatalities. In the face of international inertia, the Jewish leaders, on the eve of Britain's departure, declared the birth of the modern nation State of Israel (14th May, 1948). The US was the first country to recognize Israel. The Arab nations objected, pointing out that according to democratic principles, the governance and future of the whole territory should be decided by all its people. Declaring that in the absence of the British, no legal administration existed in Palestine, they announced their intent to intervene. The armies of Syria, Iraq, Jordan, Lebanon and Egypt invaded on November 29, 1947. What followed is known by Israelis as the War of Independence, by Arabs as al-Naqba, the Catastrophe. When the fighting ended, Israel had extended its territory to 80 percent of the former mandate of Palestine, while Jordan (itself created from the original Ottoman province by Britain in 1921 as part fulfillment of promises made to Hussein bin Ali, Sharif of Mecca during World War I) acquired portions of the West Bank, including Jerusalem. Egypt gained control of the Sinai and of the Gaza strip. Through the mediation of the UN envoy, Ralph Buncie hostilities ceased during 1949 after a series of separate armistice, with Egypt (February 23), Lebanon (March 23), Jordan (April 23) and Syria (July 20). Iraqi troops withdrew in March under the terms of the armistice with Jordan. Technically, these armistices ended the fighting but not the war. Subsequent treaties between Israel and Egypt (1979) and between Israel and Jordan (1994) have normalized relations but legally Israel and Syria, Lebanon and Iraq are still at war. During the 1948-1949 war, thousands of Arabs (estimates range from 750,000 to 900,000) became refugees, either in Lebanon or in territory controlled by Jordan and Egypt. Subsequently, in addition to the Six-Day war of 1967 and the Yom Kippur War of 1973 and armed conflict between Israel and various factions in Lebanon, Palestinians have also engaged in terrorist attacks against Israelis, Israeli targets and interests. At issue since the 1967 war, when Israel gained territory from Egypt, Lebanon and Syria, is what the United Nations regards as illegal occupation of these territories, home to about three millions Palestinians. In 1965, Palestinians then operating from Jordan carried out their first cross-border raid into Israel. Al-Fateh, the Palestinian National Liberation Movement, was formed in 1963. In 1964, the Palestinian Liberation Organization was formed under the Chairmanship of Yasser Arafat. Attacks on Israelis included the taking of Israeli athletes hosrage during the Munich Olympics (1972). Until 1988, the PLO aimed to gain control of the whole of the former British mandate of Palestine and to dismantle what it sees as the Jewish state. 1982 saw Israeli troops invade Lebanon where an anti-Israeli organization, Hezbollah, had been formed. Troops remained there until a partial withdrawal in 1985, a complete withdrawal in 2000. In 1987, the first Intifada or civil uprising broke out in the occupied West Bank. In 2000, the second Intifada started. Numerous suicide attacks followed by Israeli reprisals, including the destruction of Arab homes, have occured. In 2002, Israel began constructing a security barrier between Israeli territory and Palestinian areas. Hundreds of Jewish settlements have been created on the West Bank (those in Gaza, however, were closed down and evacuated in 2005). 1964 The creation of the Palestinian Liberation Organization, dedicated to destroying Israel and establishing an Arab state. June 5 to June 10 1967 - the Six-Day War. Israel strikes against Egypt, Syria, Iraq and Jordan, occupying the West Bank, Sinai, the Gaza Strip and the Golan Heights. UN Resolution 242 denounces acquisition of land by force. Israel is ordered to return to the 1949 borders. October 6 to October 26, 1973: Egypt and Syria attack Israel, briefly regain territory then lose it again. UN Resolution 242 calls for international peace talks. 1982 Israel sends troops into Lebanon, where the Shi'a group, Hezbollah, is dedicated to the destruction of the state of Israel. 1987 HAMAS is formed, the Islamic Resistance Movement, which rejects diplomacy or a peaceful solution to the conflict. 1991 during the Gulf War, Iraq, under Saddam Hussein, launches missiles at Israel. March-August 2006: in retaliation to the capture of Israeli soldiers by Hezbollah, Israel attacks Lebanon. Israel, with the West Bank, Gaza Strip and Golan Heights highlighted in green. West Bank and Gaza are under the control of the Palestinian National Authority. Golan Heights, annexed by Israel, is Syrian. The first major peace initiative began in 1977 when Egyptian President Anwar Sadat decided to negotiate peace with Israel, and visited the Knesset (Israeli Parliament). In talks brokered by the then US President, Jimmy Carter, the Camp David Accords were agreed. Normalization of Egyptian-Israeli relations followed, with Israel agreeing to return the Sinai to Egypt. The principle of 'land for peace' was enshrined in UN Resolution 242. Both Sadat and his Israeli co-signatory to the treaty, Menachem Begin, were awarded the Nobel Peace Prize but both were also assassinated. Later, Carter also won the Peace Prize. In 1988, Jordan relinquished its claim on the West Bank, making the way clear for the creation of an Arab state on territory then under Israeli occupation. That year, Yasser Arafat renounced violence and accepted the two-state solution. Between 1991 and 1993, a peace process brokered by the Norwegian government saw talks between the PLO and Israel. In 1993, this resulted in the Oslo Accords. Subsequently, Arafat and the chief Israeli negotiators, Yitzhak Rabin and Shimon Peres, also won the Nobel Peace Prize. The Accord established the Palestinian National Authority as the civil government of the West Bank and Gaza Strip, with the promise of statehood at a future date. However, the presence of Israeli settlements and security forces remained unresolved. In 1994, relations were normalized between Israel and Jordan. 2003 also saw the independent Geneva peace initiative, suppoted by Jimmy Carter. In 2002, the Arab League approves a Saudi plan, Based on the 'land for peace' principle, the plan included full recognition of Israel by all Arab League member states. The same year, Israel begins to construct a security wall in the occupied territories. In 2003, the United States, the United Nations, the European Union and the Russian Federation publish their "road map" with target dates for a fully sovereign and secure Palestinian state and the resolution of all territorial disputes between Israel and her neighbors. The West Bank was regarded by some Israelis as integral to Israel, thus the settlements. Many of those who settled were religious Jews who want to restore all of what was once Solomon's kingdom to Jewish control. These settlements criss-cross the West Bank and are connected by a network of roads access to which is restricted to Israeli citizens. This raises the issue as to whether a viable Palestinian state can be created while settlements remain in place. All settlements in Gaza, however, were closed in 2005. In theory, the two-state solution has been accepted by both sides. However, the status of Jerusalem remains problematic. Jerusalem declared Jerusalem its "eternal capital" in 1980, but this is not internationally recognized. Syria has offered to negotiate over the Golan Heights but Israel has permanently annexed these and so far there is a stand-off between the two states. Given the strategic importance of the Golan Heights to Israeli security, this issue will only be resolved if an absolute guarantee of Israeli's safety from a Syrian attack can be made. On the one hand, the role of the United States in brokering a permanent peace is widely held to be essential. On the other, many Muslims regards Israel as a neo-colonial presence in the Middle East, where it represents Western interests. Some go so far as to speak of a Western, US-led, Zionist conspiracy against Islam. US support for Israel is a bone of contention in the Muslim world, where many think that insufficient effort has been invested in securing a just resolution for the Palestinians. The economic condition of the people residing in the West Bank and Gaza is one of the worst in the world. Many residents do not have access to basic services, or to clean water. Due to the network of roads with restricted access, and the security wall, many have to travel miles further than necessary to get to work, or to essential services. Much has been said and written about the role of religion. On the one hand, the earliest Jewish settlers in Palestine were secular. Even in 1948, while the Declaration of the State of Israel referred to the historic association between the Jews and the land of Israel, the claim to statehood was not based on theology but on the fact that Jews had "reclaimed the wilderness, revived their language, built cities and villages and established a vigorous and ever-growing community with its own economic and cultural life" in Palestine..
Arab opposition to the Balfour Declaration and the British Mandate was not exclusively Muslim but included Christians. On the other hand, opposition at state level was also not exclusively Arab but included every Muslim member state of the UN. Opposition, too, was based on the emerging concept of Arab nationalism. While Palestine had not existed as a separate political unit under the Ottomans, since the empire was being divided up, the people who lived there saw no reason why they should not also aspire to statehood. When it was formed in 1964, the PLO was not an explicitly Islamic body. Again, it had Christian members. It was not until the creation of Hezbollah and HAMAS in the 1980s that Muslim language, such as that of jihad, was first used. It was also at this time that Muslims from elsewhere in the world began to volunteer in the jihad. On the Israeli side, use of explicitly religious language has rarely had a prominent place in political discourse, since the state is officially secular. After 1967, though, the process of settlement was led and encouraged by religious Jews. Some have spoken of restoring Greater Israel. The role of the Christian lobby in the United States, too, has played a role in its support of Israel  Believing that war in the Middle East will eventually bring about the events that will end human history, they have encouraged war (such as the invasion of Iraq) rather than peace. Whatever role religion does or does not play, at root lies the fact that two communities claim the same piece of land. While the two-state solution has been officially endorsed, some think that ways might have been worked out to enable both communities to live at peace in the same, not different, space. Numerous religious organizations inside and outside of the disputed area have attempted to bring about a reconciliation of the issues. These include Jews, Christians and Muslims. For example, the Alexandria Declaration (January 2002), whose signatories include the Sephardic Chief Rabbi of Israel Bakshi-Doron; Sheikh Tal El Sider, a Minister of State for the Palestinian Authority, together with several Archbishops and Bishops, pledges that they will jointly pursue a ‘quest for a just peace that leads to reconciliation in Jerusalem and the holy land, for the common good of all our peoples’. They call for a ‘religiously sanctioned cease fire’ and for a ‘just, secure and durable solution’ to the conflict. ‘Bloodshed’, states the declaration, must ‘not be allowed to pollute’ the Holy Land, which is ‘holy to all three of our faiths’. Both Ariel Sharon, the then Prime Minister of Israel and Yasser Arafat, then President of the Palestinian National Authority, supported this initiative, which describes itself as a parallel religious track to the political road map. The co-hosts were Dr. George Carey the Archbishop of Canterbury and the Grand Imam of Al-Azhar, Sheikh Tanwaty, who is widely recognized as the premier scholar in the Islamic world. The Inter-Religious and International Federation for World Peace, (IIFWP) through its Middle East Peace Initiative, has sponsored hundreds of interfaith pilgrimages to Israel and Palestine to express solidarity with both sides in the quest for peace. ↑ Abdel Mahdi Abdallah, "Causes of Anti-Americanism in the Arab World: A Socio-Political Perspective," Middle East Review of International Affairs 7: 4 (2003) Causes of Anti-Americanism in the Arab World: A Socio-Political Perspective Retrieved September 12, 2007. ↑ "Arab-Israeli Conflict: Role of Religion," Isreal Science and Technology Homepage Arab-Israeli Conflict: Role of religion Retrieved September 12, 2007. ↑ US support for Israel is a highly contentious issue. Jimmy Carter has suggested that official silence on the building of settlements encouraged this to happen. See Carter, 2006, 114-115. American Christians "make frequent trips to Israel, to support it with funding, and lobby the government in Washington, D.C. for the colonization of Palestinian territory’. Between 1972 and 2006, the US vetoed 52 United Nations Security Council resolutions thought harmful to Israel, more than the combined total of all other members' vetoes over the same period. Israelis receive $500 per head per year of U.S. aid, compared with $20 per head in Egypt. Israel is the only country that does not have to account for its use of US moneys. The US has also stopped the International Atomic Energy Agency from reprimanding Israel for its "undeclared nuclear arsenal' see: John J. Mearsheimer and Stephen M. Watt. The Israel Lobby and US Foreign Policy. (London: Allen Lane, 2007), 40-48. ↑ Kevin P. Philips. American Theocracy: The Peril and Politics of Radical Religion, Oil, and Borrowed Money in the 21st Century. (New York: Viking, 2006), 95 "As the forces for the Iraq invasion gathered … many Christian fundamentalists dismissed worries about oil or global warming out of belief that the end times were under way." Middle East conflict BBC News. Guide to the Arab-Israeli Conflict, historyteacher.net. Includes links to historical sources, as well as sources representing the Arab and Israeli sides of the conflict. The Origin of the Palestine-Israel Conflict ifamericansknew.org. as viewed by Jews for Justice in the Middle East. Israel News - Yedioth Aharonoth Israel's largest newspaper, centrist. Jerusalem Post, Israel's oldest English newspaper, conservative. Lebanon Daily Star, largest English-circulation newspaper in the Arab world. Al Ahram, Egypt's largest newspaper. Palestine Chronicle, weekly electronic paper. This page was last modified on 11 April 2016, at 15:22.